MANILA, Philippines - The August 2017 civil service exam results known as the career service examinations - paper and pencil test (CSE-PPT) together with the complete list of passers and top 10 (topnotchers) are posted on this page as announced by the Civil Service Commission (CSC) on Monday, September 11, 2017. CSC named those who have passed the professional (1,237) and sub-professional level (193) of examination. 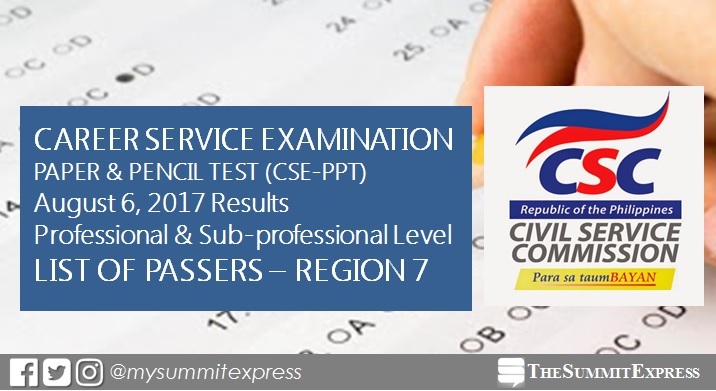 All takers may get their individual test results using the OnlineCivil Service Examination Result Generation System (OCSERGS), which can also be accessed through the CSC website. Note: The date of OCSERGS availability will be posted here soon but you may expect approximately 15 days after the posting of the List of Passers.